Gaol record of Samuel Dykes, alias Robert Lorando, identified as a Siamese national, 1885. His crime was stealing. The record is in good condition. Approximately 300 mm long x 180 mm wide. Thai people have been in Australia since 1861, but there is little evidence of their presence here in the late 19th century. Their numbers were so small that they were included with the grouping of Indo Chinese, Korean and other Asian settlers in the New South Wales census until 1901, when 37 Siamese were counted in the first Commonwealth Census. After Federation, migration to Australia was strictly governed by the Immigration Restriction Act 1901. The number of Thais officially counted in New South Wales stayed under 50 until the 1950s and did not rise in substantial numbers until the Immigration Restriction Act was repealed in 1973. This record is one of the few pieces of tangible evidence of Thai experience in Australia in the late 19th century. It is from the former Darlinghurst Goal. The record is historically significant as it provides material evidence and insight into the experience and activities of non-Anglo groups in colonial society. While the experiences of Chinese, German, French and Italian groups are documented to varying degrees, other cultural minorities, such as people from Thai backgrounds, are virtually invisible. This record is evidence of the activities of one person from a Thai background in 1885. While Samuel Dykes’ crime of stealing is obviously not representative of all Thai people in Australia at the time, the record works to create at least one piece of an empty historical jigsaw puzzle. The record has research value as it provides researchers with evidence of the experience and activities of a minority group in New South Wales colonial society. This group was part of a wider Asian community which was often victimised and persecuted by the dominant Anglo culture in the 19th century. The record helps to gain an insight into the activities of this person and has research potential to yield information on the victimisation and persecution of Asian minorities by the police, landowners and the law, resulting in the arrest of Samuel Dyke. It is significant as a rare piece of historical evidence of a known incarcerated person of Thai background in NSW. The record has social value as it provides Thai communities in Australia with evidence of the experience of a countryman living in Australia over 100 years ago. It provides documentary evidence for them to anchor themselves in 19th century Australian history, thus giving them a sense of place and belonging. It also serves to remind the wider community of the long history of persecution of cultural minorities in Australian history, and of the pre-existing attitudes that prepared the path for the Immigration Restriction Act in the Australian Constitution after Federation in 1901. The record is well provenanced as a New South WalesColonial Government record and then Archival record to this day. The documentation is held at State Records New South Wales. The record is rare. New South Wales gaol records are not rare but the record of a Thai person incarcerated in the New South Wales colonial legal and penal system is rare and historically significant. The object represents a tangible link to the experiences of Asian minorities in late 19th century Australia. Although Samuel Dykes’ crime was stealing, the record suggests the 19th century history of harsh punishments for petty crime in the NSW colony, and a harsher penal system for Asian cultural groups. The record suggests that Australia’s criminal past is inhabited by people from all cultural backgrounds. The condition of the record is generally good. There is evidence of yellowing of the paper and some foxing. The photo is in good clear condition. The interpretive potential of the record is considerable. 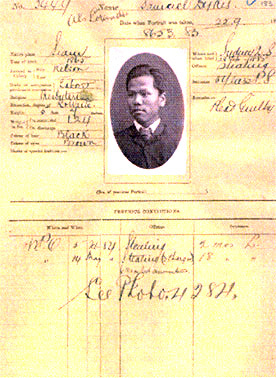 The record can be used in the story of Thai migration to Australia and settlement in NSW, placing people from Thai backgrounds in the life of New South Wales colonial society. It also interprets the incarceration of people from Asian backgrounds, the experience of incarceration at Darlinghurst Gaol and attitudes to non-European migrants in the 19th century, in particular, the experiences of those who ended up on the wrong side of the law. This object is one of very few pieces of evidence that reveals a Thai experience of this world. 1 Pollock, Z 2005, Pai Nai Ma: Thai – Australian Experiences Exhibition Catalogue, Parramatta Heritage Centre & Migration Heritage Centre, pp 3-4. Coupe, S & Andrews, M 1992 Their Ghosts May Be Heard: Australia to 1900, Longman Cheshire, Sydney. Pollock, Z 2005, Pai Nai Ma: Thai – Australian Experiences, Exhibition Catalogue, Parramatta Heritage Centre & Migration Heritage Centre.